"Turkey's membership of the European Union is a strategic target, since Turkey is a part of Europe economically, socially and culturally," Turkish Prime Minister Ahmet Davutoğlu said on Thursday. Addressing a joint press conference with Italian PM Matteo Renzi in Ankara, Davutoğlu said, "The EU and Turkey are struggling with the same problems, if Turkey was a member of the union both sides could have responded to these problems more effectively." He also added that Turkey's full EU membership would benefit both Turkey and all other member states. For his part, Renzi expressed his support for Turkey's bid for EU membership and said "We will continue to work so that the EU opens its doors more decisively to Turkey." 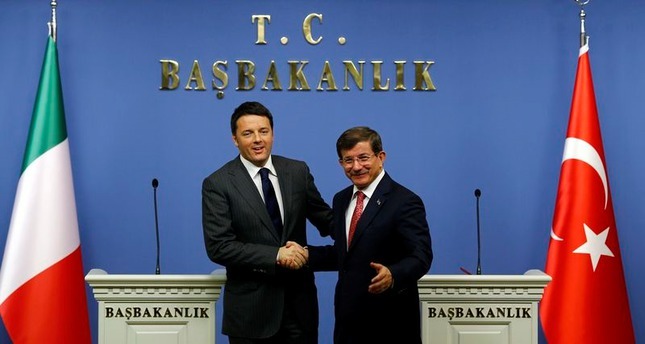 "I believe that the international community needs to support Turkey more," Renzi added, referring to Turkey's providing shelter for 1.6 million Syrian refugees. Answering a question on the UN's plan to implement 'frozen zones' in Syria and a possible cease-fire between opposition groups and the Syrian regime, Davutoğlu said, "The Syrian regime did not keep any of the promises that has been made, establishing 'frozen zones' is not a lasting solution for Syria but we are ready to cooperate on any proposal which will stop the humanitarian tragedy in the country." Davutoğlu also touched on the reconciliation process and domestic security reforms saying, "People have the right to demonstrate and but the use of violence during protests is a crime, not a freedom." He also said that autonomy for Kurdish people or amnesty is not on the government's agenda.